Add a touch of professionalism to your work environment with traditional metal customized name tags. Name Tag Wizard has a variety of styles, featuring different backing types, sizes and shapes. 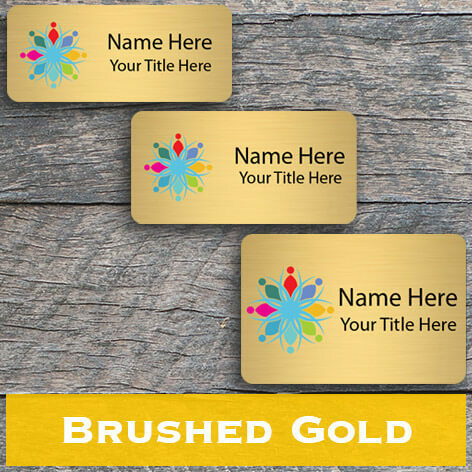 Shop our impressive catalog of aluminum name tags featuring brushed gold and brushed silver. These metal name tags can be customized with full color text and logos, or engraved. Our backing types include clips, magnets and pins. Our design wizard makes it fast and simple to upload a list of names that can be customized onto metal name tags. Why Choose Metal Name Tags? Custom metal name badges are traditional and long lasting. Whether you choose gold or silver, a metal badge looks professional on any staff member, whether they are an executive or assistant. 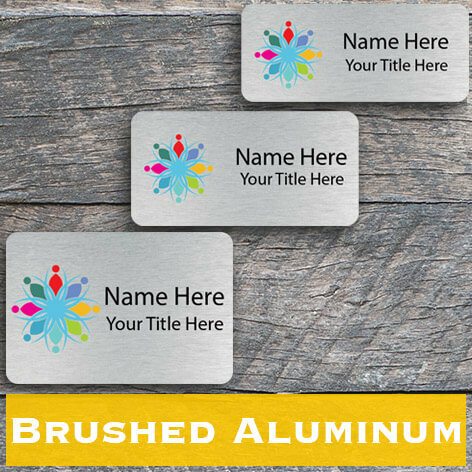 Metal name tags help create a cohesive aesthetic for your entire company, and our metal tags are made of aluminum, so you can trust they won't rust. Different backings can be applied, whether you choose magnetic backing for easy removal, or swivel clips for trusted fastening. Every industry, from retail to food service should take advantage of metal name tags that can feature engraved names and job titles. We ship your order next business day! Name Tag Wizard - your go-to for photo IDs and name tags.